With 2014 on the horizon, it’s time to look back at the year that was. Marked by homecomings, perseverance, reunions and, of course, great music, 2013 saw artists stepping up and stepping out more boldly than ever with the truth and a song. 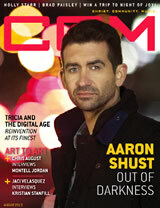 CCM reviewed the stories that made covers and pulled the best of what your favorite artists had to say throughout the year. Inspiring, transparent, passionate…they share their passion with you. Merry Christmas and Happy New Year! 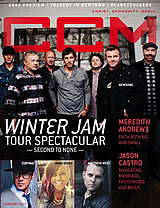 In 2013, Winter Jam maintained its position as the top tour worldwide for quarter one. Founded by Newsong, the tour has grown continuously over its nearly 20 year run and maintains a unique and intentional focus on ministry, support and follow up with those who make decisions for Christ. 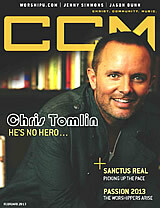 It’s difficult to put into words the impact Chris Tomlin has had on the church and the culture of worship throughout the world. His latest album, Burning Lights, showcased Tomlin’s signature knack for crafting congregational songs, while pushing the boundaries, artistically, more than ever. Read the full story here. “I think people might think I have a special connection to God, but I’m no hero. Obviously King David was out watching over his sheep, singing and pouring out to God long before he’s given a platform. And even when you have it, you’re still just a shepherd boy, singing a song to God. To the people reading this, you are the burning lights. I’m hoping to sing over the people a song that will lift them up. There’s something special about music. Generally, when a band makes a comeback, it has something to do with personal or financial interest and, more often that not, is a shadow of its former self. Not so with Audio Adrenaline. 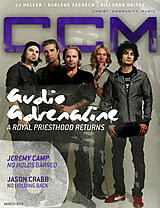 With new lead vocalist Kevin Max at the helm, Audio A has been crystal clear about their motivation to return. Drawn to the plight of orphans, the profit earned by the band will go directly into their Hands and Feet Organization which has been on the ground in Haiti for years and is the heartbeat of the band. Read more about their big return here! It’s practically a fact that Amy Grant is and has been the face of Contemporary Christian music for over 30 years. Her writing, her voice, her bold decisions raised the bar in Christian music and put it on the map in mainstream culture. As she pulled together her latest studio album, she did so with the depth and wisdom and artistry that can only develop over time. Inspired by the life of her mother, as well as a renewed intentionality about her music and life, Amy’s ministry is as poignant and relative as ever. “There are so many life truths I’ve learned from my mother that I’ve tried to put gracefully into songs,” shares Amy. I think it’s important to take stock of your life every so often,” Amy says. “Primary relationships, physical well-being, relationship with money, with our mate, with God…it’s important to look at those things every couple of years and say, ‘If there were no limitations, this is how I would like to be.’ Say them. Write them down in a way that’s anticipatory. 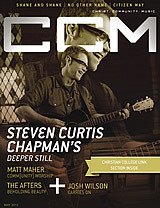 Steven Curtis Chapman represents the best of what Christian music is all about — authenticity, humility, worship and musicianship. Possessing both longevity and innovation, he has managed to grow with the changing musical landscape and connect with the world in their own language. His Deep Roots album shared his personal heritage, honoring the music and the family that has undergirded his entire ministry and career. He shares his reflections on the album and the gift of making music. They call themselves a 14-year overnight success story. 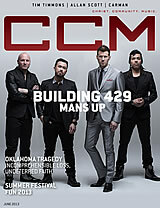 Building 429 has traversed the country and the world throughout its run in the land of CCM. When they released the epic song, “Where I Belong,” they allowed the country to get to know them all over again. Their follow up record, We Won’t Be Shaken, sits in that same sweet pocket of transparency, while providing a rallying cry of hope and inspiration to listeners and fans world wide. Keenly aware of the impact family can have on your life, heart and well-being, the guys in Building 429 are cognizantly choosing each day to model themselves after their heavenly father, rather than an earthly father, whose very humanity means he will mess up. 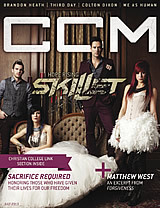 You might say Skillet stands alone in their unprecedented capacity to serve both mainstream and Christian audiences. Fes bands have enjoyed the success in regards to a loyal following and an unapologetic, yet subtle dissemination of the love and truth of Jesus Christ with audiences of every creed, culture and conviction. Rise was a pinnacle release for them. It reminded audiences around the world that they are not only amazing musicians; they see the world beyond the church and have allowed the truth of culture inform the messages of hope they craft through their songs which not only have the potential to reach every corner of the globe; they are reaching every corner of the globe…and the fruit is thriving. And that’s the heart of Skillet…honoring God with their talents and then stepping out of the spotlight to let the Holy Spirit do its thing, which includes bringing circumstances into the lives of the band members to serve as muse for the music. Aaron Shust first captured the attention of the church with “My Savior, My God.” Since then, this father and husband has walked a journey no parent should have to — two of his children have faced life-threatening illnesses. Throughout the hardship, Aaron has maintained a resolve in the sovereignty and purpose of Christ and His plan. And when darkness descended time after time, Aaron fought the adversity with the sword of spirit and truth. 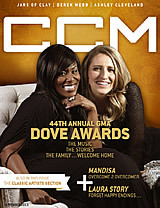 The Dove Awards have been dubbed Christian music’s biggest night. And for 44 years, they have represented the pinnacle of success in this industry. The past several years, however, have cast a shadow on the music industry overall, and events like the Doves have suffered. This year, however, the Doves returned to their home city of Nashville, Tenn., with a refreshing element of intentionality, humility and gratitude. “The future of the GMA lies in the hands of our community,” says GMA Executive Director Jackie Patillo. “As long as there is a thriving body of believers who have the same mission, there will be a need for the GMA. This past year has been about the task of assessing how the foundation needs to be re-laid. I believe that together we are going to move forward as a united front in a way that will allow the GMA to be relevant and serve the Christian and Gospel music communities. “If you know me at all, you know that what God did thru the song ‘Blessings’ is so much bigger than some yahoo like me could ever make happen, and I love that about God! He calls us to be part of something bigger than ourselves. ‘Blessings’ was more an adventure God called me to be part of, and I will be forever grateful for that,” she says. A few years ago, they were Born Again. 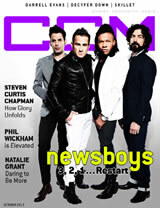 This year, the newsboys have hit Restart — literally. Their latest studio recording is a work of seasoned veterans. Relevant both sonically and lyrically, this is the kind of album that explains the group’s longevity and reach, while demonstrating that the band is as sharp, creative and passionate as ever. 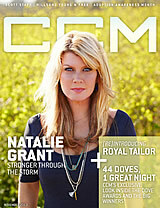 Natalie Grant is a woman’s woman. The mother of three exudes vitality, joy and purpose…while allowing herself the transparency that puts others at ease and offers hope to those who are struggling. For 20 months, she westled with post-partum depression that nearly robbed her of that joy. After a time of contemplation and surrender, Natalie has come through the storm and shares the journey and the promise of tomorrow in her most personal album to date, Hurricane. I will hear Him call my name not because I have preached for more than 70 yers. Not because I have doe anything good. I will hear my name because His sheep hear His voice (John 10:27). 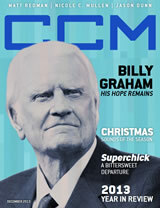 – Excerpt from My Hope, Billy Graham, Thomas Nelson, pp.176-177, 2013.